Each Carrier Contains: 10 Kit Kat, 10 Reese's Pieces, 8 Hershey's Milk Chocolate, 8 Hershey's Milk Chocolate With Almonds, 8 Twizzlers, 8 Reese's Peanut Butter Cups. Each Carrier Contains: 10 Kit Kat, 10 Reese's Pieces, 8 Hershey's Milk Chocolate, 8 Hershey's Milk Chocolate With Almonds, 8 Twizzlers, 8 Reese's Peanut Butter Cups. 4 Carriers per case. You'll have a pre-established customer base with the sweetly familiar tastes of our Hershey's candy bars - Kit Kat, Hershey's chocolate, Twizzlers, and Reese's Pieces. Your supporters will not stop at just one! Up to 48% Profit: Your profit varies from 30% profit to 48% profit depending on how many cases of candy bars you order. Minimum Order: Just 5 cases to start your fundraising campaign. Free Shipping: Shipping is completely free, no matter how many cases you order. Delivery for this product takes 3 weeks. Temperature Warning: Is your weather hotter than 80 degrees? If so, we may need to ship by a refrigerated truck which means shipping costs may apply. Your Group Keeps Up To 48% Profit! The More You Sell, The More You Profit! Calculate How To Reach Your Goal! How Does The $1.50 Hershey's Chocolatetown Plus Fundraiser Work? 1. Determine how many candy bars you feel each of your group members can sell, so you know how many cases to order. Each case contains 4 carriers of 52 candy bars each, for a total of 208 bars per case. The minimum order is 5 cases and shipping is free (additional shipping may apply if temperature is above 80F). 2. Place your order online or over the phone. You may pay using a credit card, money-order, or if you’re a public school you can issue a purchase order form. 3. Shipping is quick: We always ship out your product the next day following receipt of your payment. Depending on your location, shipping time is 7-10 business days. 4. Prepare and send a letter to your group members and their parents so they are aware of the objective of your fundraiser, collection dates, and your contact info. 5. 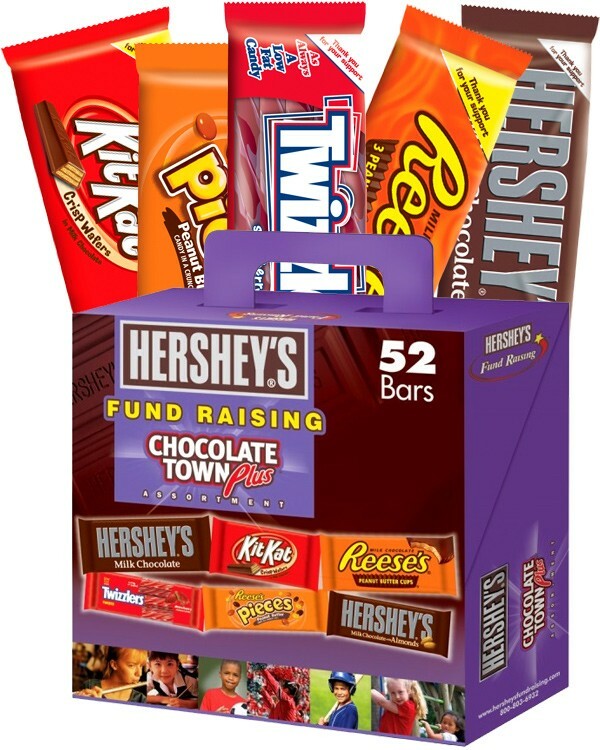 Keep track of how many candy bars or carrier cases you have distributed to each of your fundraising participants. Ideally, have the parents pick it up so they become more involved in the fundraiser. 6. Your participants will sell each of these Hershey ChocolateTown Plus candy bars for $1.50 each, and collect their money on the spot. 7. Keep a tally of all the money you collect from each of your participants throughout your fundraiser. 8. When the fundraiser is complete, be sure to send a Thank You note to all parents and kids who participated. 9. Count the profit made from your fundraiser! Safety Tip: If your participants choose to fundraise door-to-door, they should always be in the company of an adult. PLEASE NOTE: This is ONLY for customers who have completed their fundraiser. Thanks! Top value for your supporters. To match your group's needs. Getting started is a no-brainer. Or we'll beat best price! ©Copyright 2019 by JustFundraising. All Rights Reserved. Peruse the Terms & Privacy.